My small indoor Sago Palm's fronds have recently started to twist. Why? This can be an indication that the sago is not getting enough light. Move it to a brighter location and that should help. Less likely, but possible, is that it is flowering. 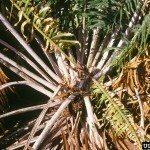 This does not happen often and only happens on fully mature sago palms. But sometimes when they start to flower, the inner fronds curl up.